This page hosts a list of security related software and articles that could aid with providing a safer computer usage experience. Some of these software packages offer free editions, in most cases the link to the free version will also be available. Disclaimer: The links provided here are for informational purposes only and do not represent an endorsement by, or affiliation with the respective providers. Readers make use of the advice and software (largely untested) at their own risk. A selection of tips and tools for parents who want to ensure their child's online safety and security. While iOS is generally considered to be quite secure, a few configuration items can improve its security. Some changes have very little functionality impact, while others are more visible but probably only needed in specific environments. This guide, compiled by Rapid 7, contains some of the most important, obvious ones, and contains a GIF for each configuration step to be taken. If you already know everything about iOS security, use this as a way to easily explain to friends and relatives how certain configurations are changed. A summary of the most common Personal Security Scams by: Alert Africa. Educate yourself regarding identity theft, classified ads theft, social media scams, rental scams and more. A summary of South African Revenue Service (SARS) scams and phishing attacks. As South African tax payers need to be aware of email scams, SARS has created a section on their website where they post updates of any scams they have heard about. A discussion on the Insider Cyber Threat with Prof Basie von Solms on Brink. Read the full article here. The Conversation: What South Africa is doing to make a dent in cyber crime. SSL and TLS: A beginners' guide by: SANS Institute. Read the paper here. Security Week whitepapers (various topics) available from: Security Week Research Library. Find a topic here. Do you know how secure your digital identity is? By: SimpliSafe. 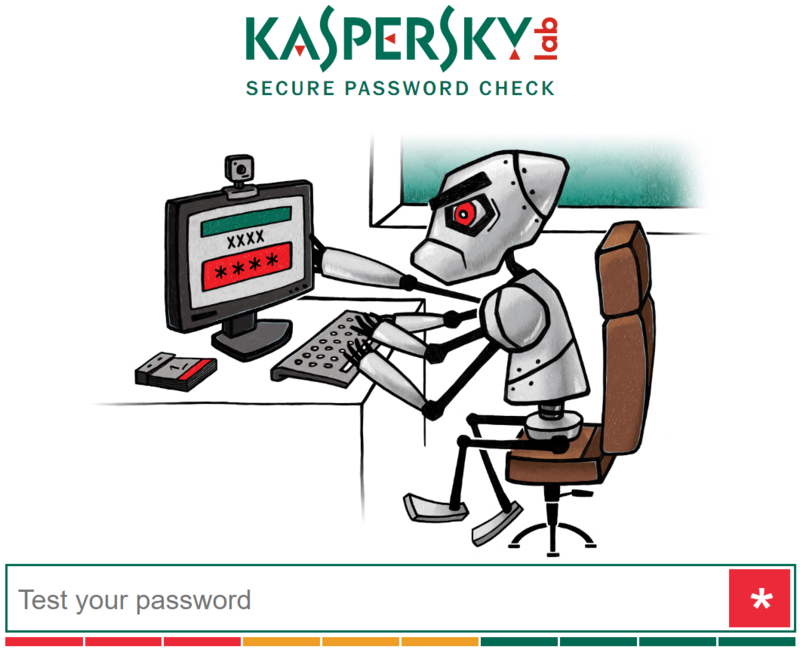 Online Secure Password Check by Kaspersky Lab. See how strong your passwords are by clicking here or clicking on the image below. It is also important to know that some of the Anti-Virus Software Packages listed above come with firewall bundled as part of the package. So it is not always necessary to install a separate firewall package. Most modern Windows Operating System Versions are released with a software Firewall. Note that these standard firewalls will in most cases not be as effective as some of the software firewalls listed above. This link is provided for informational purposes only and does not represent an endorsement by, or affiliation with the US-CERT (DHS).